In addition to sourcing onions from a variety of fine growers throughout the Treasure Valley, we have grower partners, Murakami Growers LLC. These partners have committed one hundred percent of their crop to our operations. The owners are Klahr & Sons of Parma, ID, a third-generation farm that includes Russell Klahr, his son, Barry, and Barry’s son, Alex; Scott Cruickshank of Ontario, whose third-generation farm is worked by sons, Chance, Chase and Chad; Rick and Larry Kitamura of third-generation Kitamura Farms on the Oregon Slope; Ronny Koda, third generation of Koda Farms, which includes his father, Steve, and uncle, John, in the Vale region of eastern Oregon; Ken Laubacher of third-generation Oregon Slope Laubacher Farms, which includes his son, Ryan; and Ron and Glenn Kuwahara of Kuwahara Farms, a third-generation onion farm in the Vale region. The group represents some of the Treasure Valley’s finest onion growers. 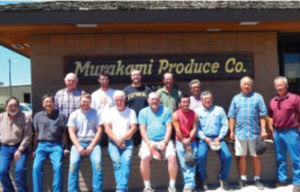 Murakami Produce Co. has been pleased and proud to work with such top-level grower partners. And now this grower ownership will enable Baker & Murakami Produce Co. to continue to deliver high-quality onions to its customers with these dedicated supplies.